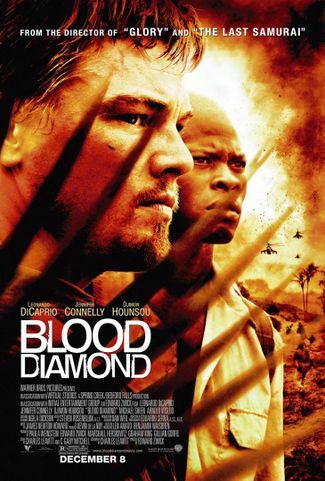 Blood Diamond theatrical release poster. A freelance smuggler looks for conflict diamonds in the midst of Sierra Leone's civil war. He meets an escaped enslaved miner, who looks for his son kidnapped to be made a child soldier, and who carries a dug-up huge rough diamond. Gippsland GA8 Airvan landing at an airstrip. Wrecked PA-23-250 Aztecs at the airstrip. Another wrecked PA-23-250 Aztec with Mozambique registration C9-ANI. South African registration (non-type certified aircraft) ZU-BOI, c/n 3532421809222. The Mi-24 attacking the RUF mining camp. Colonel Coetzee disembarking the Mi-24. Solomon Vandy's family arriving in London aboard the Learjet 45.